When you create a new app, it is set to be available in all marketplaces by default. If desired (and especially if your APK supports localization), you can localize the store listing (the descriptions and image assets) of your app in other marketplaces to provide a better experience in those marketplaces. When distributing your app internationally, you can decide which countries and regions to target with a localized app experience in the Appstore. The "Appstore" refers to your app's store listing in on the website or in the device's store display. 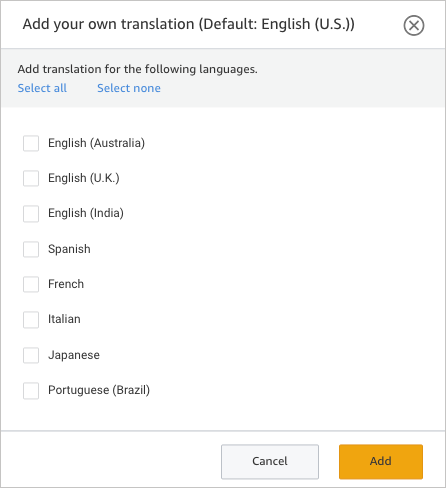 Users who view your app in an Amazon marketplace that corresponds with one of these languages will see the localized version of your app's description and image assets. If the user's country or region is outside of a supported Amazon marketplace, English is used by default. Note: Make sure you have the necessary rights to distribute your apps and content everywhere you designate for your app to be distributed. For example, it's your responsibility to ensure your app complies with all applicable export and import restrictions of the countries or regions you select. Note that these localizations refer to your app's storefront page in the Appstore (where your app is presented to users to download), not localizations that your APK can support on actual devices. You can localize your APK is as many languages as you want. When users install the APK on their device, the language strings that get used in your APK depend on the language settings of the user's device. Suppose that in addition to supporting English, you localize your APK (following standard Android localization practices) to also support Japanese and German. You also localize your app's descriptions and image assets (referred to as your app's "metadata" because they're outside your app) in the Appstore with Japanese and German localizations. When users in Japan download your app (from the amazon.co.jp marketplace), they see the Japanese descriptions and image assets in the Appstore; when users load the app on a Fire device, they see the Japanese strings in your app's UI by default (assuming their device's language is set to Japanese). When users in Germany download your app (from the amazon.de marketplace), they see the German descriptions and image assets in the Appstore; when they load your app, they see the German strings in your app's UI by default (assuming their device's language is set to German). In each case, you have just one app in the Appstore and one APK that you've uploaded. (You don't need separate apps or separate APKs for the different localizations and marketplaces.) All metrics for your app (ratings, downloads, etc.) are rolled up into a unified display. The following image shows the various Amazon marketplaces and the countries/regions and languages they're associated with. A marketplace isn't always synonymous with a country. Marketplaces are language-specific. For example, the amazon.de marketplace (German) is also used for Austria and Switzerland; the amazon.fr marketplace (French) is also used for Belgium and Luxembourg. Not all types of Fire TV devices are available in all marketplaces. For example, Fire TV Edition and Fire TV Cube are available only in the U.S. Because of this limited availability, these devices don't actually have a Language option for users to switch languages. During the app submission process, even if you indicate support (in the Device Support section of the APK Files tab) for a Fire TV device not available in a particular country or region, the Appstore's display logic is smart enough to exclude any devices not available with your app in that marketplace. Tip: Fire App Builder provides an example of how to support localization in your Android app. When you submit your app into the Appstore, the Developer Console allows you to provide localized descriptions and image assets for your app. Note the following options as you submit your app. Each option is explained in the sections below. By default, when you submit your app, it becomes available in every marketplace. But if you only want your app to be available, say, in Japan (perhaps because your app only supports Japanese), you can select Japan as the only available country for your app. You can restrict the availability of your app to specific countries and regions on the Availability & Pricing tab. Next to Where would you like this app to be available?, click Only in selected countries and regions and select the countries and regions where you want your app to be available. Important: If you select one or more specific countries to list your app, and you do not live in one of the selected countries, you may not be able to download your app from the Amazon Appstore once it becomes live. If you charge for your app, the Availability & Pricing tab also lets you set prices in each marketplace. By default, Amazon will calculate the list price used to calculate royalties for sales of your app in foreign currencies based on recent exchange rates. However, you can change the list prices as desired. For example, an app that sells for $2.99 in USD becomes ₤1.96 Pounds in Great Britain. You might want to change the list prices to end in .99, .49, or other common values in each marketplace. The Appstore calculates these other list prices proportional to the amazon.com list price, so the auto-generated list prices for other marketplaces might end in oddly specific prices. After you select the localizations you want to support, the submission console adds tabs for each language. Note that if you don't provide a localized description, the English (U.S.) description will be displayed instead. The Images & Multimedia tab lets you upload your app logo, background image, screenshots, and other image assets that are used to promote your app within the Appstore. The APK Files tab provides a "Language Support" section with various language check boxes you can select. Note that the Language Support selection here doesn't influence whether your app becomes available in other, localized Appstore marketplaces. Any localization interfaces in your APK must be handled by your APK itself, not through settings in the Appstore submission process. For example, if you select Tagalog as a supported language in your app, on the devic's' Appstore details page, a Supported Languages section appears letting users know that Tagalog is supported in your app. When a user launches your app, whether Tagalog appears as the default language in your app depends on how you've coded your APK and whether the user's device settings have selected Tagalog as a preferred language. The Appstore won't deliver a Tagalog localized experience to users by default because Tagalog is not a language preference option in either Fire TV or tablets. But you might provide a way within your app for users to select such a language.